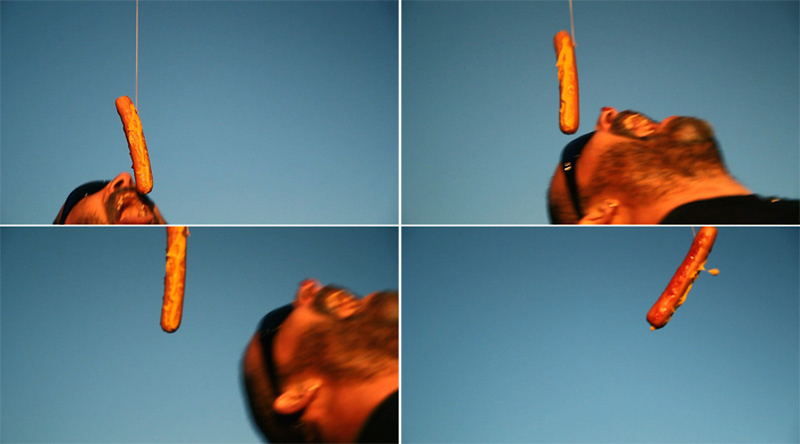 This work shows motorcycle passengers trying to catch a mustard and ketchup-covered suspended hot dog with their mouth. Historically, American women would play this game at biker parties and it later became popular at gay biker parties. In the early 2000’s I made a documentary film about a friend of mine who has a past in one of America’s oldest gay organisations, The Denver City Bikers. For The Lion Sleeps Tonight I restaged a scene from that film, this time together with straight bikers from my Swedish hometown Avesta. The Lion Sleeps Tonight I & II (2012) from Magnus Monfeldt on Vimeo.